Note: I realize this review may be a little late, as “Bears” was released into theaters on April 18th. However, with no opportunity to preview before the release day, I still feel the need to share with anyone still deciding whether to see this movie or not. “Disney” and “Nature.” Two things I absolutely love in this world. The beauty of outdoors, and the fun and memories of the premiere entertainment company for many. Combine the two, and this should be a match made in heaven for this DisNerd, right? Up until now, I’d have to say, sadly, wrong. Don’t misunderstand me, I think highly of Disney for attempting these beautifully shot wildlife documentaries released annually around Earth Day. The fact that every year they donate proceeds from opening week to conservation funds? Even better. But, unfortunately, I’m a bit of a wimp. I find it difficult to see animals encountering hardship and perhaps even dying when faced with the elements. Yes, Mufasa explained the great circle of life quite well to me, but that doesn’t mean I can stomach seeing it happen. As amazing as Chimpanzee looked to me, the harshness of a chimp being orphaned made the subject matter hard for me to want to watch, even more so with a little one next to me. I know many have loved the movies, and I’m grateful for that – to see Walt Disney’s “True Life Adventure” legacy carried on in some form is something I’m genuinely happy to see. To raise awareness of animals in their natural habitat is wonderful and definitely to be admired; it’s just not something I can always emotionally handle. Apparently, this has been passed down to my child as well – which, given the fact that she’s six, is quite understandable. So it was with a little trepidation, Mrs. DisNerd and I decided to take the Little DisNerd to see the latest offering, “Bears,” this past weekend. We did our research beforehand, reading plenty of reviews as to the family-friendliness of the new DisneyNature film. Definitely ready to enter the world of Bears! I’m pleased to report that not only did we emerge from the film psychologically unscathed, but we also left with smiles on our faces and a love for all things bear. Set against the backdrop of a gorgeous Alaskan wilderness, “Bears” follows the first year journey of Sky, a mama grizzly, and her two cubs: “mama’s bear” Amber and the mischievous Scout. Emerging from hibernation, they begin their harrowing journey from their mountainous den to the waters far below in search of food – namely salmon – in order to nourish themselves and fatten up for the next years hibernation. Along the way, they face danger in the form of avalanches, wolves, rising tides, and yes, other bears – mainly in the form of two male grizzlies, Mangus (the alpha male) and Chinook (the exiled, haggard, desperate bear). Of course, the biggest danger lies in not finding enough food to fatten up for the coming hibernation season. If Sky can’t get enough food, she may not be nourished enough to provide for Scout and Amber through the next winter. Looking out for two youngsters make a regular journey much more harrowing, as usual spots can become unsafe due to overbearing males or other predators. This journey is perfectly narrated by actor John C. Reilly, who combines informational narrative with storytelling and humor, namely in his voiceovers that delve into the insights of the curious and adventurous Scout. We found “Bears” to be adventurous, humorous, educational, and overall, heartwarming. The story of changing priorities and ambitions is one parents can relate to: when you have little ones, it changes the way you do everything when parental instinct kicks in. And kids? Kids will love the adventures of the cubs, as well as learn something. Our little one, who loves playing in character after seeing movies came home wanting to be “Bear friends.” This consisted of calling each other by the names of Sky, Amber and Scout, and consuming lots and lots of imaginary salmon dishes. I would definitely recommend this documentary for the whole family. On one last note – we saw this opening weekend, and I was saddened to see we were three of nine in a rather huge movie theater. What kept families away? Was it the documentary nature of the film? The possibility that true life may be too graphic for some? The lack of animated characters that kids so love to see on the big screen? 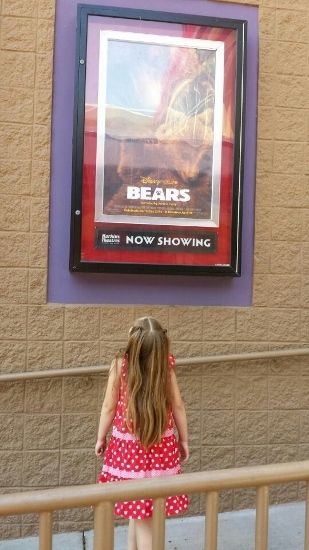 Whatever the reason may be, I truly hope more moviegoers give Bears a chance – it’s truly a movie for the whole family. Plus, if you can see it in its opening week (which is through April 24th, 2014), the Disney Worldwide Conservation Fund will make a contribution to the National Park Foundation in honor of those who were able to see the movie. 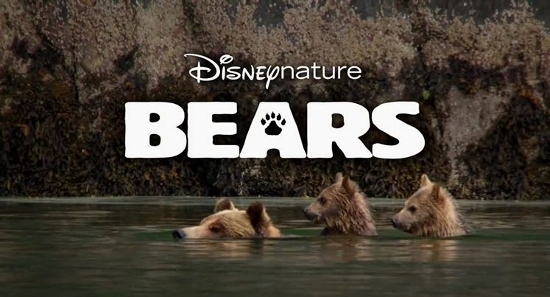 This Earth Day, I encourage everyone to see Disneynature’s “Bears,” tell others about it, and support great movies and features like this in the theaters. Have you seen “Bears?” Do you plan to? Feel free to comment below, or share this review with others, and let’s fill the theaters for this one! P.S. – Be sure to stay through the credits to see footage of the film crew at work, getting these breathtaking shots at some rather “too close for comfort” distances!